While there is an explosion of women participating in athletics today, a shockingly small number of them are coached by women.Prior to Title IX, 90% of female athletes were coached by women, today it’s around 40%! Explore why having women coaches matters, hear some of their barriers and celebrate a few successes. Twin Cities PBS Producer Sherece (Shari) Lamke won a regional EMMY with “Media Coverage and Female Athletes”, another partnership with the University of Minnesota’s Tucker Center. She has also produced documentaries such as “The Art and Life of George Morrison” and been the Executive Producer for nationally distributed Christmas Concerts with the Colleges of Concordia, Gustavus Adolphus and St Thomas in Minnesota. Twin Cities PBS Associate Producer and Editor Carrie Clark has worked on programs such Media Coverage and Female Athletes, Heroin at Home, Out North, and most recently Women in Sports Leadership. Over the years her work has won 6 Emmys and been recognized through an IFP Access grant, a Jerome Foundation grant and film festival awards. Read the full Q&APBS spoke with Filmmakers Shari Lamke and Carrie Clark about how important women coaches are to the development of female athletes and sports culture as a whole. PBS: How did you choose the subjects you wanted to profile/interview for your film? Shari Lamke and Carrie Clark: This is the third time we’ve partnered with the University of Minnesota’s Tucker Center for Research on Girls and Women in Sport to raise awareness of critical issues being faced by women in sport. We knew a key to getting folks to care about this issue was to introduce them to a few successful women coaches to illustrate the data being provided by a renowned researcher. We needed to see coaches in action, as well as talk to them about the barriers and successes they’ve had in their careers. We found two sports camps willing to give us full access. 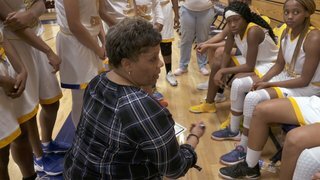 One was a basketball camp run by Faith Johnson Patterson, a Minnesota Basketball Hall of Fame coach, recruited as a head coach by a couple of high school athletes initially, and who went on to win eight state high school titles with teams she led. The day we arrived to spend with her she had just learned that the high school she had been coaching for, for just a couple years, was letting her go. She discovered it from the parents bringing their kids to the camp, not the administration making that decision. Still, she gave us full access to her camp and sat down afterward to provide incredible insight. The other camp was a soccer camp led by four women coaches focused on helping female athletes change one’s mindset to leadership, not just on honing their skills. We also took advantage of women coaches and sports leaders from around the country who were attending the Women Coaches Symposium at the University of Minnesota, for further insights. Twin Cities PBS (TPT) is one of the nation’s leading public media organizations. Through the power of broadcast, digital, and local and national engagement, TPT advances education, culture, and citizenship to enrich lives and strengthen communities. TPT has been recognized for innovation and creativity throughout its 60-year history, receiving numerous Peabody, and national and regional Emmy awards. Based in St. Paul, MN, TPT is one of the highest-rated PBS stations in the country, reaching more than 1.3 million households each month through multiple broadcast and digital services. TPT’s areas of focus include: unleashing children’s love of learning; advancing STEM education; engaging first-stage adults; connecting communities to arts, culture and history; and serving the needs of America's aging population. Rewire is a national public media initiative that offers smart, fresh, original, thought-provoking content that inspires individuals to make their lives better.